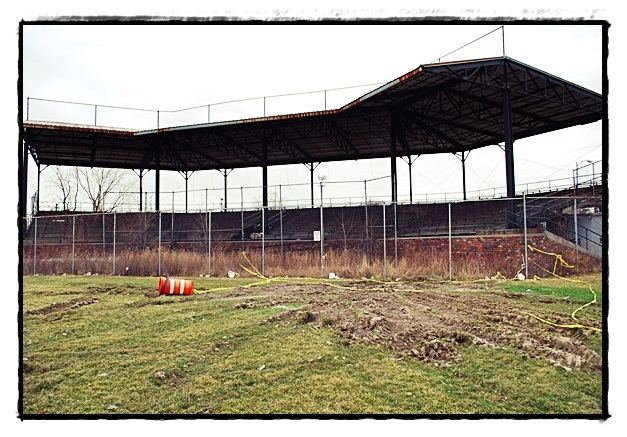 Now that Hamtramck Stadium has achieved National Historic status, it’s time to raise money to fix it up. That was the outcome of the most recent meeting of the Mayor’s Committee to Save the Grandstands. Preliminary estimates of restoration costs are $500,000 to $1 million though an official assessment has yet to occur. In addition to raising renovation funds, the committee also must now determine how the grandstand and field will be used once work is completed. While various ideas have been tossed around there is only one thing certain at this point — public input will definitely be involved. So far, some possible uses include utilizing the grandstand as an outdoor venue for concerts and public events, as well as using it as a location for films set in the relevant historical era. It is even possible that some form of semi-pro baseball team could one day bring baseball back to the city. Until then, the public will have several opportunities to voice their opinion. The first will be at this year’s Hamtramck Labor Day Festival, where a survey will be administered to gauge initial public reaction regarding possible site uses. The second will be a meeting, the date of which has yet to be determined, where the public can participate in a discussion on the matter. At this meeting community members he will be able to voice their opinions and offer feedback to ideas generated through the initial survey. Further chances for the public to provide input will be coming up as the committee aims to keep residents informed and involved. Regardless of the eventual outcome, future use will balance present needs with respect for the past. For more information on Hamtramck Stadium visit www.hamtramckstadium.org. Is the field being used to play baseball? Isn’t it feasible to play ball on the field while waiting to fix the grandstand? If not, can the field be made playable? Could a playable field be used to raise more money? It just seems a shame the field is still sitting idle when there are so many baseball history lovers.